My all time favorite dressing is Old Spaghetti Factory’s Creamy Pesto Salad dressing. I’ve made my own copycat version so I can enjoy it at home all the time. It is definitely a family favorite. 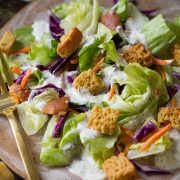 Not only do I dress my salad with it but I use it the same way you’d use ranch, for example, to dip fries or pizza in or to drizzle over baked potatoes. When I serve it alongside a breaded chicken I always end up dipping my chicken in it too. That is why I decided just to create a recipe that incorporated it right in from the start rather than just dipping it. 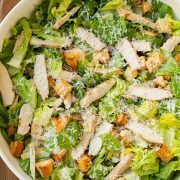 This is similar to a baked ranch chicken only with a Pesto salad dressing and some Parmesan instead of ranch dressing. Technically it should probably be called Crispy Pesto Dressing Parmesan Chicken (because it doesn’t use pesto, but rather pesto dressing) but that’s far to long so I went with the shorter version. This chicken is so flavorful and delicious! I love the flavor of basil and it works wonders to this chicken. And that perfectly golden, crispy bread crumb coating that you get to sink your teeth into is incredible. Spaghetti Factory should consider adding it to their menu =). I love this as it is but I think sometime in the future I may even try it with a little bit of lemon zest. Enjoy! Chicken breasts are coated with a creamy pesto parmesan dressing dredged in breadcrumbs and baked until tender and crisp. Preheat oven to 400 degrees. Butter a 13x9 baking dish. 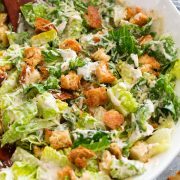 In a shallow bowl, whisk together mayonnaise, buttermilk, dried basil, 2 Tbsp Parmesan cheese, 1/8 tsp garlic powder and season with salt and pepper to taste, set aside. 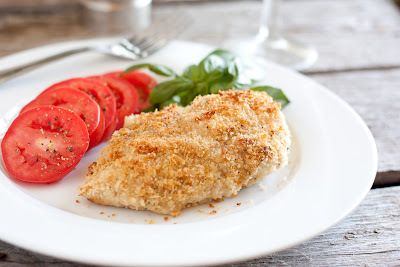 In a separate shallow bowl, whisk together Panko bread crumbs, dry white bread crumbs, remaining 2 Tbsp Parmesan cheese, onion powder, 1/8 tsp garlic powder then season bread crumb mixture with salt and pepper to taste. Dip chicken in basil (pesto) dressing mixture and coat both sides, then dip in bread crumb mixture and coat both sides (I'd recommend giving a generous dipping in each). 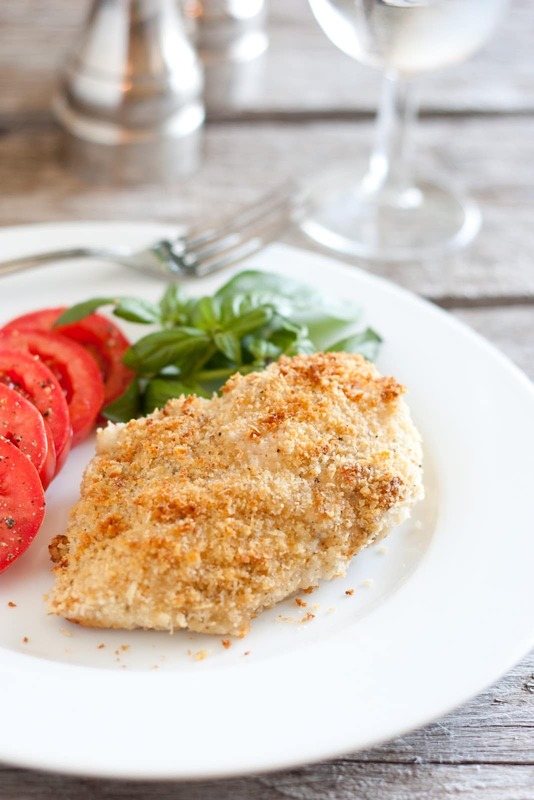 Align coated chicken breast halves in a single layer on baking dish. Spray tops of chicken breast halves evenly with olive oil cooking spray. Bake chicken in preheated oven 30-35 minutes until cooked through (I wanted mine nice and golden so I moved the oven rack up a bit during the last minute of baking and broiled them. If you do this don't walk away from them, watch them constantly to prevent over browning). Serve warm. list of which ones to try first. Ashlee Christopher: WOW you are so talented I am so happy I found this blog! Way excited to be your newest follower!